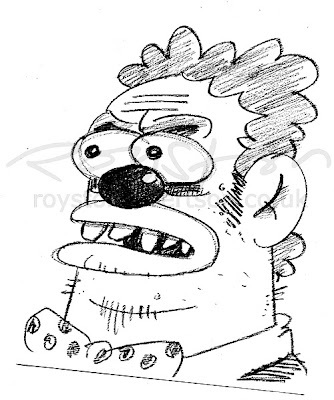 Regular readers to this blog will know that when I doodle I often seem to end up drawing sinister and/or sleazy looking clowns. Some people have even been helpful enough to suggest that this indicates some deep-seated psychological problem and I should probably seek help. I'm starting to think they may be right, as even by my standards the guy above, who emerged yesterday when I was supposed to be thinking of a cartoon for a client, is pretty disturbing. Ha, thanks, Anon. I knew it was a recognised syndrome, but I don't really think I suffer from it! I just like drawning sinister clowns. After all, if I was coulrophobic I wouldn't want to create more clowns. BTW, surely two of the sufferers you mentioned are fictional characters (and one of them hangs out with a clown quite a lot). On reflection, I think "scary" is a bit misleading. The "It" style clown in a common image, popular with Goths and Slipknot fans, but that's not really what I draw. Mine are more sleazy and unshaven looking, they're often tired or depressed (I'm digging myself in deeper here ...) as though they've become disillusioned with the whole clowning lifestyle! Definitely debatable in the case of Mr Diddy. Royston - the thinking here is all wrong. Drawing pictures of sleazy, sinister or otherwise desirable clowns is probably stopping you having a deep-seated psychological problem. 'Getting it out there' is healthy! I should know, I encourage people to do this sort of thing all the time! Drawing characters is not at all the same thing as becoming one, or acting out in real life. I keep telling myself this, as I have evidently been spending too much time looking at the work of Martin Honeysett, and it's beginning to affect mine! I really feel like I'm lying on the couch talking about this now, Cathy! Maybe I'm in denial but I really don't think I'm exorcising a fear of clowns by drawing them. But maybe it's just about the drawing of unpleasant characters generally.